This quiche is great for taking on picnics, it keeps well in the fridge, and is nice served either cold or warm for lunches or dinners with a salad. It is also quick and economical to prepare and is what Mum calls a “throw it all in” recipe because leftovers in the fridge get thrown into the basic egg and flour mixture. Unlike usual quiche recipes, this one has no pastry base, and is known as a ‘self-crusting quiche’ because as the quiche bakes, the egg and cheese form the crust. 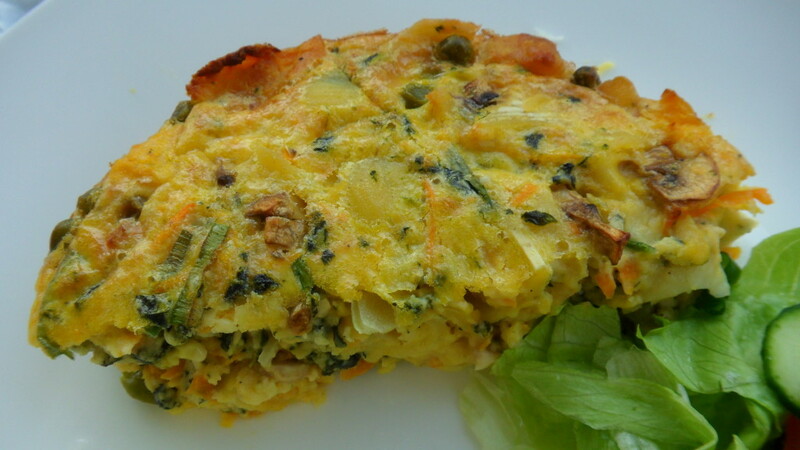 Below are two recipes – the first one is the original Impossible Quiche recipe, and the second is an example using ingredients that can be added to the original recipe. Put all except bacon into jar with lid on and shake for 1 minute. Pour into greased dish and top with chopped bacon. Bake at 180 degrees Celsius for ¾ of an hour. The above recipe in its original, simple form is fine on its own, but we take this recipe as the starting point and add into this many other ingredients depending on what is in the fridge. The following recipe is an example of this where we added in leftover cooked pasta, leftover vegetables from a roast dinner, plus a selection of extra fresh vegetables. The result can be seen in the photo at the top of the page. TIP: If you are adding a large amount of vegetables or vegetables with a high water content, (e.g. courgette or cooked spinach), you may need to adjust the recipe to add more eggs. Cut all raw vegetables up finely (or grate) so they cook in the quiche. Mix all ingredients together and place into a greased baking dish. Cook at 180 degrees Celsius for ¾ of an hour. A cheap dinner made from leftovers means there is more money to spend on a good wine…. With our Impossible Quiche we had a tasty red wine: Squawking Magpie, Hawke’s Bay, 2013, The Chatterer, Syrah.